BAYOMBONG, Nueva Vizcaya – Nueva Vizcaya Governor Carlos M. Padilla delivered an inspirational message during the Cagayan Valley Agriculture, Aquatic and Resources Research and Development's (CVAARRD) Farms and Industry Encounters Through the Science and Technology Agenda (FIESTA) on Citrus. The Citrus FIESTA was held on September 13-14, 2018 at the Capitol Convention Center, Nueva Vizcaya with the theme, "FIESTA in the Valley: Convergence Towards Support and Development for the Citrus Industry." CVAARRD is one of the R and D consortia of the Philippine Council for Agriculture, Aquatic and Natural Resources Research and Development of the Department of Science and Technology (DOST-PCAARRD). 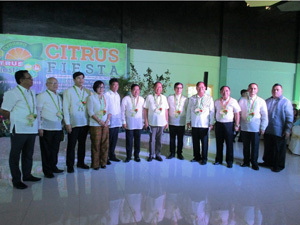 Padilla mentioned that the citrus industry provided employment opportunities and improved the quality of life of the farmers in Nueva Vizcaya specifically in Malabing Valley in the Municipality of Kasibu, where citrus is grown abundantly, making Nueva Vizcaya the citrus capital of Region II. Gov. Carlos M. Padilla together with SUCs consortium member agency heads and PCAARRD's OIC Deputy Executive Director-ARMSS Melvin B. Carlos. Padilla expressed hope that Nueva Vizcaya will become the citrus capital of the Philippines. Nueva Vizcaya also produces citrus-based processed products such as wine, cider, soap and spread. Aside from Malabing Valley, citrus is also planted in 5-7 barangays. Alfonso Namujhe, Nueva Vizcaya's pioneer citrus producer, was the pioneer in citrus production in the province and became the role model of many citrus farmers. The Department of Science and Technology (DOST), DOST-PCAARRD, Department of Trade and Industry (DTI), Department of Agriculture (DA), Nueva Vizcaya State University (NVSU), and other State Universities and Colleges helped the citrus industry in Nueva Vizcaya to become a success.